Being a fat Labrador is no fun at all. 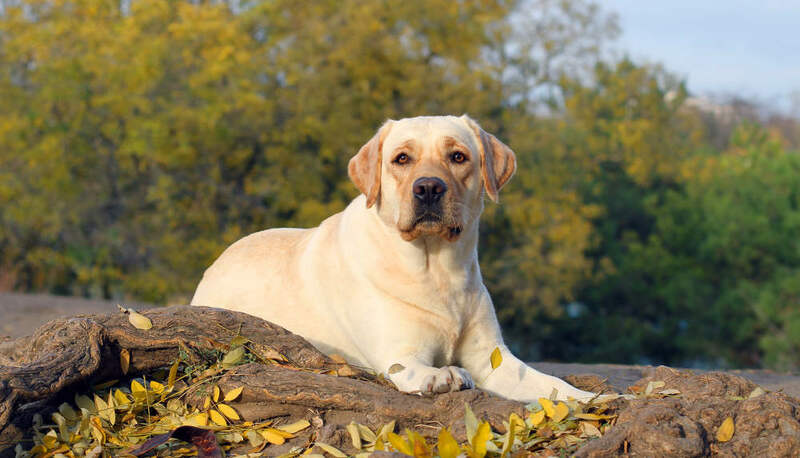 In this article we’ll help you find out whether or not your Labrador is a bit too fat, and show you how to help your dog lose weight. [wp_ad_camp_5]Obesity is a huge problem in domestic dogs both in the UK and USA. And ever more countries are joining this unhappy group. What is more, Labradors are particularly likely to gain too much weight. Canine obesity comes with a raft of accompanying health problems, just as it does in people. Feeding your Labrador just the right amount can be a bit of a balancing act, but it’s one that you have a responsibility to try your best to achieve. 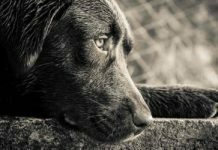 Not all Labradors need the same amount of food, so you will need to pay attention to your individual dog’s needs, and be prepared to change your habits if necessary. Some dogs like working dogs for example, will need quite a lot more food in the winter than they do in the summer. This is down to the amount of exercise he is getting differing dramatically in the changing seasons. You need to adapt your feeding to suit these shifts. 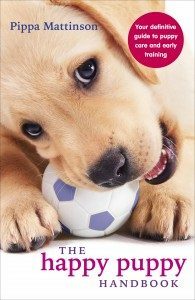 It is really important that you keep your Labrador’s weight appropriate for his height and build, rather than following guidelines on food packets or in books too closely. The best way to tell is by eye and touch. 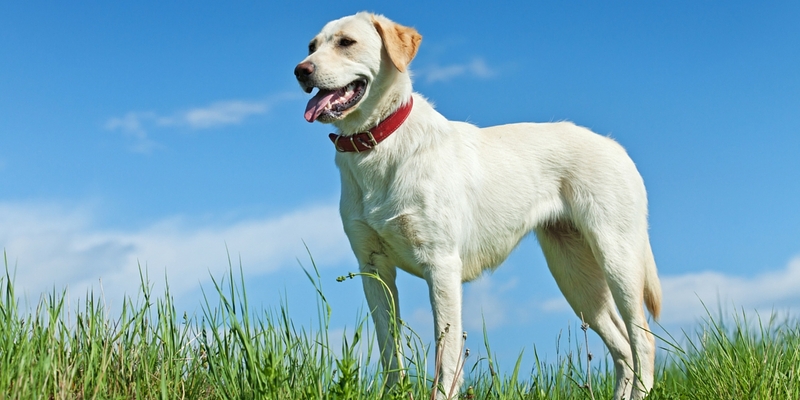 Have a look at your dog and compare him with the picture below of a healthy Labrador. Does his belly slope upwards towards his groin, or is it a level line from his front legs to his back, or even worse is it sagging down between his legs? Your Labrador should have an upward sloping line from the base of his chest, towards his back legs. Now look at the dog from above. Can you see a ‘waist’ just in front of his hips? You should be able to! Your dog should not be the same width all the way down his body. Look at your dog from the side again. Can you see any ribs? You should not be able to see a lab’s ribs whilst he is standing still though you may well be able to see the last one or two when he is eating, drinking or bending and twisting. Run you hands along his rib cages firmly. Can you feel his ribs? Ideally you should be able to just feel, but not see, your dog’s ribs. If you can see ribs when he is standing still he is too thin. If you cannot feel his ribs at all with your hands he is too fat! As we have seen above, the best way to tell if you have a fat Labrador is by looking and feeling. The trouble with providing you with a number is that it can give a false impression. [wp_ad_camp_2]Depending upon whether your Lab is field or bench bred, short or tall, chunky or slight, male or female, will all make a big difference to their ideal weight for the individual. The average adult Labrador will weigh anywhere between 55 to 80 lbs! Male Labs usually being around 5 to 10 lbs heavier than their female counterparts. 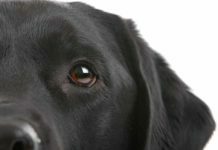 If you are still unsure whether your Lab is the right weight for his or her build having given her a thorough check yourself as described above, then the best thing to do is to pop down to your local veterinarian. They will be happy to let you know how much your individual Labrador should weigh. Why is my Labrador fat? So how did your slim little puppy end up as a fat adult Labrador? There are three common assumptions that people make when considering how their dogs came to be overweight. Does the dog need more exercise? Has he got some kind of medical problem? Or am I just feeding him too much at mealtimes or giving too many snacks? In general if your dog is overweight the real reason is simply that he has eaten too much. Or rather, been allowed to eat too much. 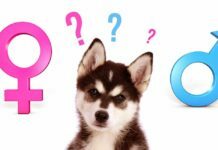 So let’s have a look at how we can eliminate these other possibilities where most dogs are concerned. Does my dog need more exercise? Whilst exercise can help to keep your dog in shape as a part of their daily routine, it is not the critical factor when it comes to putting on weight. He may well need more exercise, but that is not why he is fat. He is overweight because when you take into account the amount he exercises along with a number of other factors, he has eaten too much. The less exercise you give the dog, the less you must feed him. You can’t be forever playing ‘catch up’ with his weight, or hoping to spend more time walking him next week. Once put on, weight is hard to shift and it will simply go up and up over time. You need to control it on a regular weekly/monthly basis, starting now. 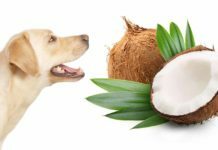 Although most dogs who are overweight have simply had a few too many bites to eat, there are some medical causes for obesity which do crop up from time to time. 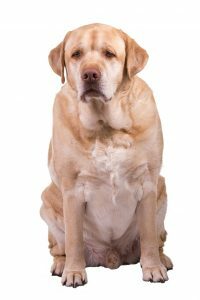 Canine medical conditions that can affect your Labs weight include hypothyroidism, insulinoma and hyperadrenocorticism. If a medical condition is the reason then the weight gain will normally be sudden and unexpected. 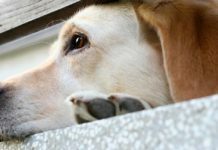 If you are concerned by sudden weight gain in your Lab when you have not been giving him more food, then a checkup at the vets is definitely in order. You may also find that your dog puts on weight after having been neutered. If this is the case you will need to adjust your feeding habits accordingly. However, for most dogs weight gain is a simple result of over feeding. Most Labradors are always hungry. You cannot win this battle. These are greedy dogs and your Labrador will always want more food than you give him. No matter how much that may be. If your Labrador is overweight he really needs to eat less and he will get used to his new regime quite quickly. 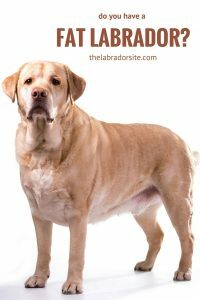 Are fat Labs less healthy? If you have looked at your Labrador and decided he is overweight, you might be wondered whether that actually matters. You still love him and he doesn’t care what he looks like – so why should you bother? Is it really worth the effort of ignoring those puppy dog eyes and whines for extra food? Aren’t chubby Labs just even more cute and cuddly than their skinny friends? Whilst it’s true that your dog has no interest in his outward appearance, he will be the one suffering on the inside if you allow him to get fat. Being overweight predisposes you to an awful lot of unpleasant health problems. This is true regardless of whether you are a human or a dog. Carrying extra pounds can also make existing problems your dog may have worse. For example joint problems like arthritis and hip dysplasia can be exacerbated by having more weight to lug around. As well as joints and bones suffering from obesity related issues, increased body fat can also make your dog more likely to have problems with their organs including those needed for breathing and digestion. Being a fat Lab puppy can potentially make your dog more likely to suffer from joint problems later in life. Not only will a slim dog have a better level of fitness and a lower likelihood of becoming unwell, they will in all probability live longer too. 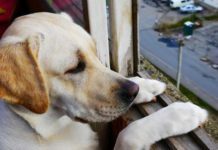 Purina PetCare carried out a lifetime study on 48 Labradors, where they were divided into two categories, one of which was given 25% more food than the other. Those Labs on the large food ration had a median lifespan of over 11 years old. Those on the smaller food ration lived to be over 13 years old. When you look at the difference which can be made in these terms, by helping your Lab to stay slim you could be giving him an incredible two more years with you! So, if you are going to help your Lab to lose weight let’s have a look at the best way to go about it. The first thing to cut out of your overweight dog’s diet is any snacks or fillers that you give him in between meals. If he gets a lot of household scraps these may have to go too. If you use food as rewards in dog training, this should be deducted from his daily food allowance. It could also help to find healthier alternatives to your usual training treats. Bear in mind that if your dog is unwell, old or very young, it is sensible to consult your vet before tampering with his diet. It is also a good idea to have a chat with them beforehand if your dog is very overweight and has a lot to lose. If your dog gets nothing to eat but a complete dog food then you can safely simply reduce the quantity you give him by about a third for three to four days. Take a photo of him from above and from the side before you start. At the end of the three to four days, check the dog over as described above and ask yourself if he is still fat. If you think he has improved a little but needs to slim down a bit further, keep going for another three to four days then review the situation. [wp_ad_camp_1]Compare the photo you took a week ago and you should see some improvement. Keep going until your dog has a ‘waist’ again and you can feel his ribcage when you press firmly along his sides. You may need to increase his food slightly in order to maintain his new slim figure and ensure he does not get thin. If the dog is not losing weight after a couple of weeks on two-thirds of his previous food allowance, you may need to cut his food down even further. This is a good point to check in with your vet, let him know what you are doing and get his opinion on cutting down further on the dog’s daily food rations. Dogs are so lucky when their owners take a responsible attitude towards food and force them to lose weight if they are fat. These lucky dogs never have to worry about portion size, or wrestle with their conscience over that extra piece of cheese. You take care of all that for them. The whole process is stress free and the dog starts to feel the benefits quite rapidly. Less weight means it’s easier to move and breathe, joint pain is relieved and the dog will often have a new lease of life. Do your dog a favour and give him a better chance of good health and long life. Keep him slim. This article is part of our diet and exercise series. Exercise is an important part of keeping your dog healthy too. You can find out more in the extensive articles in our health section. 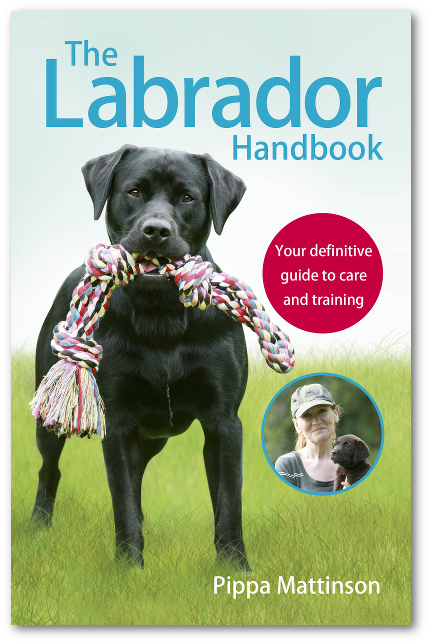 Have you struggled with your Labrador’s weight? Let us know how you helped him to stay fit in the comments section below. This article has been revised and updated for 2015. My 5.5 years old lab is 115.6 pounds. But his vet always say that his weight is according to his size and he isn’t fat. He’s pretty active too. So, I don’t agree that maximum labrador weight is 80lbs. A 100+ pound heavyweight labrador can be healthy and active. The struggle is over and our Big Brown Coca Puppy,….Joe is no more….. We tried diets and it worked for a while but he would not feel well. Then we found a good place to take him swimming and he was doing mighty fine and he loved it and so did we! Then winter set in and no more swimming. Poor Joe was depressed on top of it all and so were we. His weight started to climb and the vet put the blame on me of course. His legs gave way to his age and got too hard to walk down or up stairs and in an out of the jeep. We gave him plenty of help but he struggled with it. Not being able to talk to us was difficult to understand what his needs were too. He was 25 lbs over weight and cutting back on his food just was a chore. I found little ways to make it work and trick Joe into thinking he was getting the most out of breakfast and supper. I divided his meals up so that he got small amounts but more often and he was happy with that. We just had to make a decision yesterday to end his life and it hurts so bad that we can barely talk about it. He just reached his 12 birthday and we were looking forwards to those up north swims that would make it all work again, which nearly got here on time. Joe was trying hard too. Yesterday he gave me those sideways looks like he knew it was coming to this…… We had one of those conversations where we look at each other and know what we are saying when my husband interrupted. We had to make a decision and I felt like one of those times when I am slipping down the side of a muddy ditch and someone is asking me something they need an answer for right then and there. Just help. Pedigree is no good, especially no good for weight loss. Kibble across the board has very high carbs. You need to feed a low carb diet and monitor the calories. I personally recommend BALANCED home cooked food, BALANCED home prepared raw or commercial raw. You will see the pounds drop, have a more energetic doggie, have a healthier doggy and most importantly he will live longer. We have a 4 year old American Lab. He’s about 95lbs. Fat. He’s also lazy. The vet suggested feeding him chicken and rice with vegetables- or other people food (red meat, potatoes, liver etc..) we’ve cut out processed dog food completely and he’s already shed weight and he’s much happier to receive his people food. His coat is also much healthier and shines. I have a 20 month old lab/golden mix with the opposite problem. He does come from american or “field” labrador lines, and as a young dog, he had chronic gastro issues which we have seem to have finally figured out, after extensive blood tests etc. He is now on a hydrolyzed protein, “hypoallergenic” diet (Royal Canin) which has worked wonders. He lost a lot of weight in the Fall during these sickness bouts. I was originally weary of putting him on Royal Canin, but with a new “lets do what works” motto, it has been the only food we’ve tried that has worked for him. He used to take 5 massive, runny poops a day, and now only has 3, smaller solid ones. Here is my issue; he is getting almost 5 cups a day (broken into 3 different meal times) which is a lot of food, even for his weight. I would like him to be around 75 – 77 lbs (he has a very tall, lanky and long frame). I can BARELY keep him at 73 lbs. His ribs are not visible, but almost. You run a hand over his sides and spine, and they’re RIGHT there. If he drops a pound or 2, he’ll look emaciated. The vet thinks he looks fabulous (they love seeing lean labs), and after deeming nothing wrong with him, they urge us to keep doing what we’re doing with the new food, keep him exercised etc. In your experience with labs, does weight gain tend to happen slowly? I simply cannot give him more food than what we’re giving him, I fear he will explode or bloat. We have a Black Lab/ Hog d dog mix. Ziggy is my life, we adopted him from the Humain Society just over 9 years ago. He had surgery twice within the last 6 years for cysts but weren’t cancer. He does have fatty by 40’s. He gets plenty of exercise in the afternoon hours, and he just loves the Snow. Should I be worried about these 40’s? I have a black lab golden cross, and she is almost 6 years old. She’s overweight, but no matter what I’ve tried or what the vet recommended is helping. They’ve done testing too, and have found nothing wrong. What is the best brand of dog food to feed her? My vet has her on Pedigree Healthy Weight, but reading the ingredients…it doesn’t seem so healthy to me. We have an English black lab very broad chest at his heaviest weighed 125 now down to 109 in 6 months 2-3 mile walk a day and 1 cup of healthy weight dog food in the am with a small dog treat same at night if you give your dog your left overs tone it down. Our dog used to get prime rib ect. Now he gets the last bite and that’s it. We have a 3 yr old lab who is 110 lbs and know he is over weight. Has been this weight for last 3 mths now walks on and off leash wih long sprints in between walking. We do feed him extra treats but also fresh vegies and fruit for treats. What do we do? I have a 3 year old Labrador. I adopt it from my uncle. At the time I take him he is too skinny, and it’s been 5 months from the day I taken him to my home. But still he is not gaining weight, I live in India..m feeding him good but still I am not getting a good result. We are at the other end of the scale ,Mollie our choc field lab almost 5 is 24 kilos ( 52 .9 lbs ) ,fit active ,loves to chase her ball across the fields and fast. Always been very conscious of fat lab syndrome ,gets fed predominantly dog food ,and the odd treat ,bones etc ,does not beg or look for food as in excessively hungry and the bin is right by her food bowl ,got caught once ,never bothered since !! We are concerned perhaps we are under feeding her .